Cold cathode tubes are distinguished from hot cathode tubes in that they do not use a separate heated element in order to generate free electrons (thermionic heating). Rather, a 'starter' type process is used to initiate the electron generation and then a cascade multiplication keeps the process running. 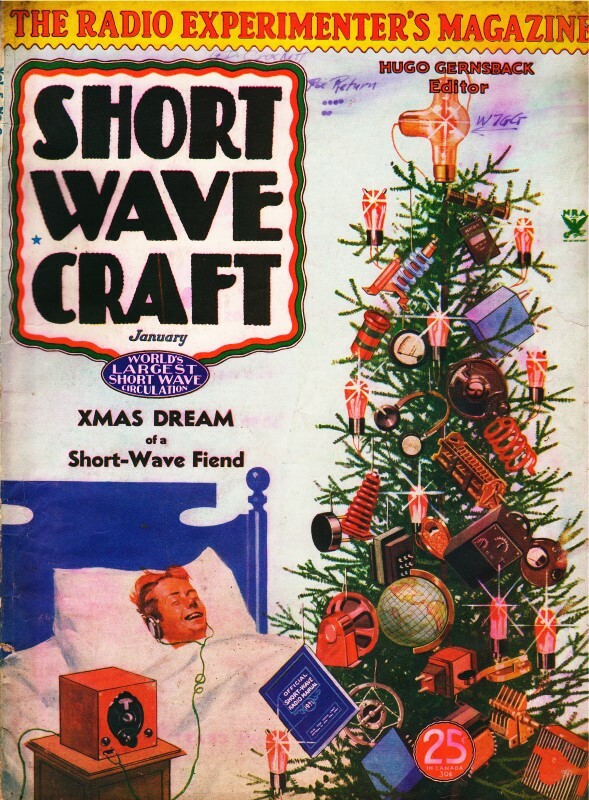 Although this article reports on a cold cathode oscillator vacuum tube - designed by none other than television pioneer Philo Farnsworth - some more familiar examples are neon and fluorescent bulbs and even the veritable Nixie tube. 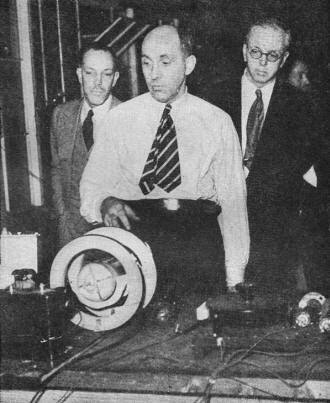 Ralph M. Heintz (center) explains the operation of the Farnsworth Cold Cathode Tube to Bernard H. Linden (left), U. S. Radio Inspector, and Donald Lippincott (right), director of Television Laboratories, Inc. 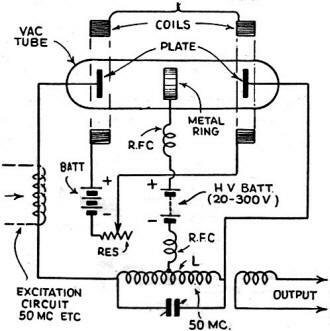 The Electron Multiplier as a high-frequency self-excited oscillator. Hook-up of "Cold Cathode" Tube. Mr. P. T. Farnsworth, of television fame, has displayed his genius by inventing a cold cathode tube. The new tube has no filament or grid and is one of the outstanding tube developments so far to take place in the radio industry. The tube consists of two cathodes and a ring-anode sealed in an evacuated glass envelope. It can be used as a detector, modulator, or oscillator, and has tremendous possibilities. It can be made to generate oscillations over a frequency range from 2000 kc. to 60 mc., the limits of which only depend on the dimensions of the tuned circuits and it has a power output of approximately 25 watts with 35 watts input. At a recent demonstration, one of these new tubes was used to maintain communication between San Francisco and Honolulu, and between New York and San Francisco, on approximately 35 meters. On this test, the cold cathode tube was used to drive a pair of 150 watt tubes in the final amplifier of a transmitter. With 1100 volts, at 30 milliamperes, on the anode, ample excitation for the two 150-watt tubes was obtained. The cathodes of these new tubes are coated with Caesium silver oxide to facilitate secondary emission. A large solenoid is placed around the tube and supplied with direct current in order to maintain an intense magnetic field which envelopes the tube. When used as an amplifier, a high frequency voltage should be applied to the cathode terminals and a DC voltage should be applied to the anode, to hold it at a positive potential with respect to the cathodes. 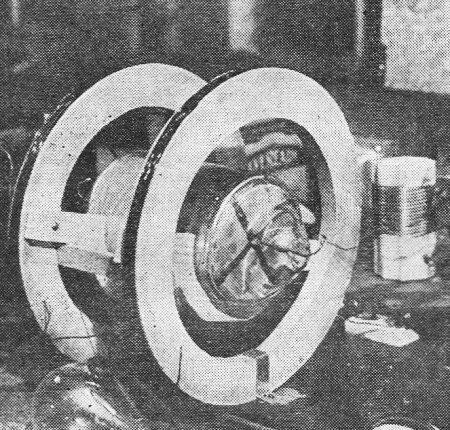 In this case, the cathodes are shunted with a coil and variable condenser in parallel. This tuned circuit, of course, should resonate at the frequency of the applied high frequency voltage. The longitudinal magnetic field prevents any flow of free electrons in the inter-electrode space from being drawn to the anode. The high frequency electrostatic field draws them to the alternately, positively charged cathodes. The strength of these several fields can be adjusted to allow an electron to be shuttled back and forth between the cathodes any desired number of times before it is finally drawn out of circulation at the anode. The high velocity electron striking the cathode causes the emission of from 2 to 8 secondary electrons, the number of secondary units depending upon the velocity of the impact electron and thus upon the amplitude of the voltage, which is applied to the cathode. Each emitted secondary also causes the emission of more secondary electrons, the process being rapidly cumulative and gives rise to a tremendous amplification of current. The anode attraction which causes electrons to leave the vicinity of the cathode and which increases its velocity as it approaches the plane of the anode also decelerates its velocity as it leaves the anode plane, and approaches the second cathode which is charged positively so as to attract it. The resultant velocity may not be sufficient to cause emission from the second cathode but in order to insure this emission, additional energy must be imparted to it. 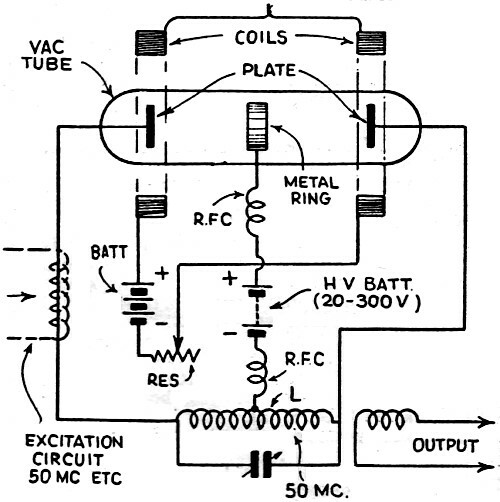 This energy is obtained from that stored in the resonant circuit shown in the diagram. The high frequency supply is of the order of 50 megacycles and should be loosely coupled to the tuned circuit in order to apply from 25 to 90 volts across the cathode terminals. One hundred volts or more can be applied to the anode depending upon the desired output. Maximum current output is obtained when the anode voltage is just sufficient to allow an electron to travel from one cathode to another during one half of the high frequency excitation cycle. The external magnetic field can be then done away with, if the cathodes are properly curved instead of being plane. This curvature can be calculated so as to focus the electrons automatically for specified anode and cathode voltages. This would eliminate the D.C. supply for the magnetic focusing.